Radial Engineering has unveiled a range of new products at the 2018 NAMM Show, which opened its doors yesterday at the Anaheim Convention Centre in California. The new product debuts follow on from the announcement that Mike Belitz, president and CEO of Ultimate Support Systems, has acquired the company. 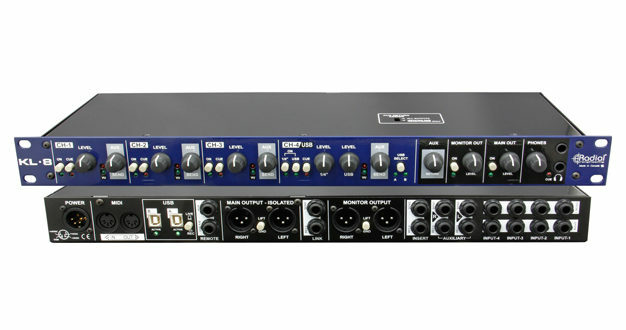 First up is the KL-8 rackmount keyboard mixing station (main picture, above), designed to provide complete control over a professional keyboard setup, both on stage and in the studio. Up to four analogue keyboards can be connected in mono or stereo, each with an individual level control to adjust the balance between them. The SW8-USB (pictured below) utilises dual USB inputs with separate 24bit/192 kHz 8 digital to analogue converter cards, allowing two computers to be connected in tandem. Both computers will see the SW8-USB as an available audio and MIDI interface, allowing for instant connection of both digital workstations. MTC can be passed between both computers, providing easy start/stop synchronisation between them. The AC-Driver (pictured below) is a small but powerful preamp for acoustic instruments on stage. EQ and volume adjustments provide users with complete control, while a variable low-cut filter removes excessive low frequencies, along with a notch filter and a 180° polarity reverse switch to help eliminate feedback. Meanwhile, the Catapult Mini (pictured below) is the latest addition to Radial’s Catapult modular snake system, allowing users to drive four analogue audio channels over a single shielded CAT 5 cable and eliminate the need for bulky and expensive multi-pair audio cable runs. The company has also announced that a number of its other recently released products are now available for shipping, including the MIX2:1, a summing mixer that passively sums two audio channels down to one. This lets users easily sum the stereo outputs of a console, recording interface, or portable playback device down to mono, or to mix any two signals together and balance their relative input levels. The SAT-2 stereo audio attenuator and monitor controller is also now available from Radial. When using the SAT-2 as a monitor controller, it can be connected in between a playback device or recording interface, and a pair of powered speakers, making it equally useful in a recording studio, or with a simple PA rig to control overall output levels. 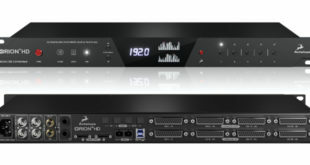 Finally there is Backtrack, a compact stereo audio switcher designed for bands running redundant backing tracks on stage, or for switching between any stereo audio sources. Connect both source devices to the Backtrack via ¼" or 3.5mm connectors, and switch between them or mute them altogether using the front panel controls or a JR-2 remote footswitch. Stop by Radial’s Booth 15717 at NAMM this week to check out new products from the other companies in the Radial family, including Primacoustic, Hafler and Jensen Transformers Inc.